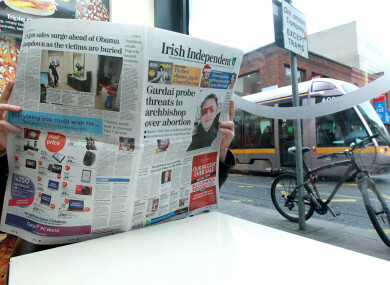 IRELAND HAS FALLEN two places in a worldwide press freedom ranking, and is down seven places from two years ago. The study, published this week by non-profit Reporters Without Borders, sees the country drop from 14th to 16th. The study says that the concentration of ownership across private and state-funded channels and defamation laws mean the country’s media is less free than Costa Rica, Jamaica and Austria among others. It adds that the proposed Communications (Retention of Data) Bill has been criticised for failing to provide protections for journalists. It also adds that speaking to gardaí is “virtually impossible”. Overall, the report said that worldwide reporters were the target of a growing wave of authoritarianism with leaders whipping up hostility against them. The group accused the world’s three superpowers — the US, China and Russia — of leading the charge against press freedom, with Trump regularly launching personal attacks on reporters and Beijing exporting its “media control model” to strangle dissent elsewhere in Asia. The slide towards “strongman” and populist politics in Europe, stoked by Moscow, was threatening freedoms in the region where they were once safest, it added, with Hungary, Slovakia and Poland setting off alarm bells. Czech President Milos Zeman turned up at a press conference with a fake Kalashnikov inscribed with the words “for journalists” while Slovakia’s former leader Robert Fico called journalists “filthy anti-Slovak prostitutes” and “idiotic hyenas”. “The unleashing of hatred towards journalists is dangerous and a threat to democracy,” RSF chief Christophe Deloire told AFP. “Political leaders who fuel loathing for reporters… undermine the concept of public debate based on facts instead of propaganda. To dispute the legitimacy of journalism today is to play with extremely dangerous political fire,” he added. Saudi Arabia, Bahrain, Vietnam, Sudan and Cuba also remain among the worst offenders, according to the RSF ranking of 180 countries. Email “Ireland has slipped down in press freedom rankings because of concentrated ownership and defamation costs”. Feedback on “Ireland has slipped down in press freedom rankings because of concentrated ownership and defamation costs”.